Central Park Sketching and Art Meetup Group: We met yesterday at Stuyvesant Square for a Portrait Party. Four of us sat together and simultaneously sketched each other. 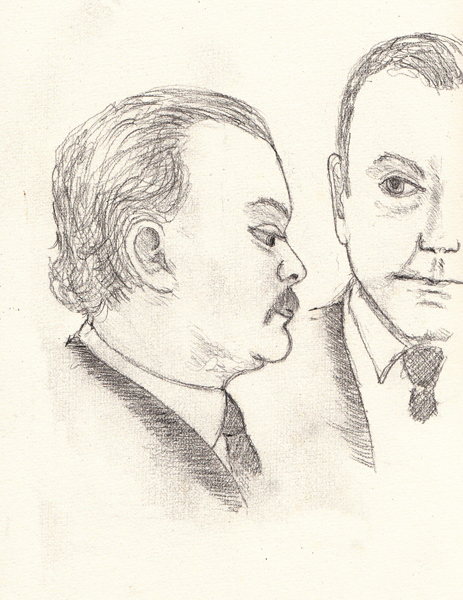 It was somewhat difficult to sketch a face when our subjects were also sketching - but it made for some good laughs. My husband and I are watching "A Touch of Frost" - a British police procedural - and last week Netflix posted a May 28 end date. I took a screen shot and sketched Jack Frost and his superior Norman Mullet to remember how much we enjoyed this sensitive, curmudgeonly, unorthodox, brilliant detective. 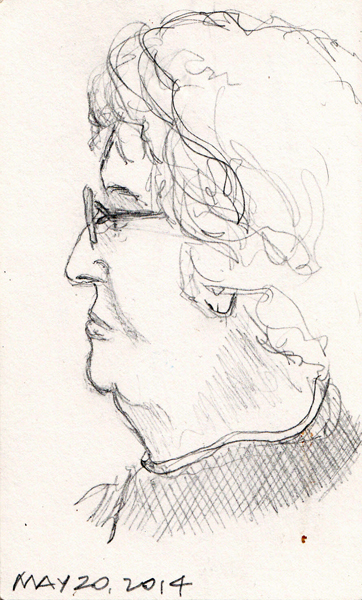 I periodically do a quick sketch of my 95 year old mother. 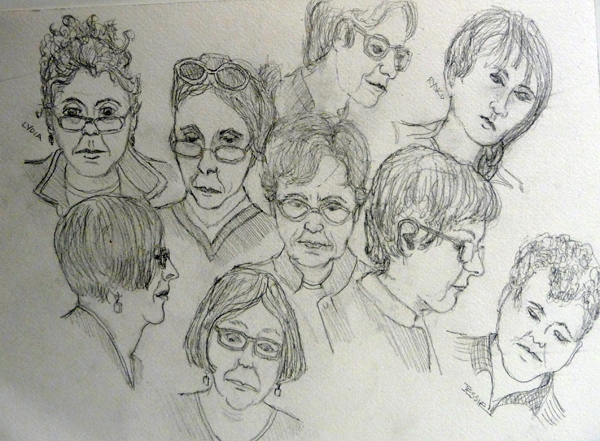 Most don't look like her, but the sketch ladies resemble each other. This profile is a little better than my full face sketches. 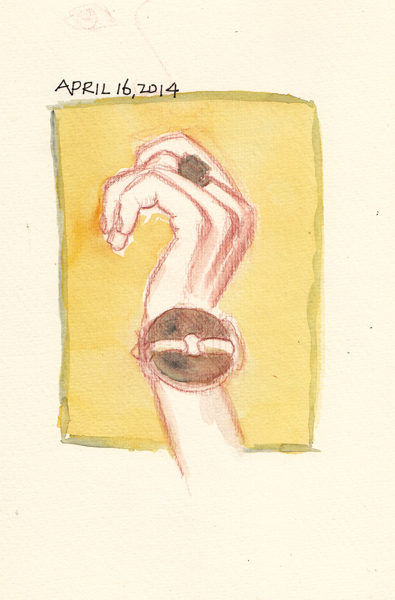 I constantly practice drawing hands. 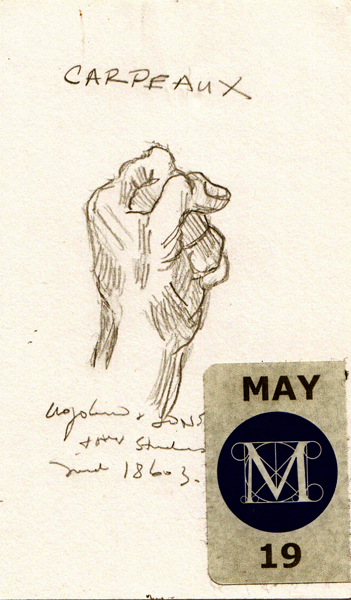 The Met had a wonderful exhibit by the 19th C sculptor Carpeaux and I loved seeing his practice drawings. 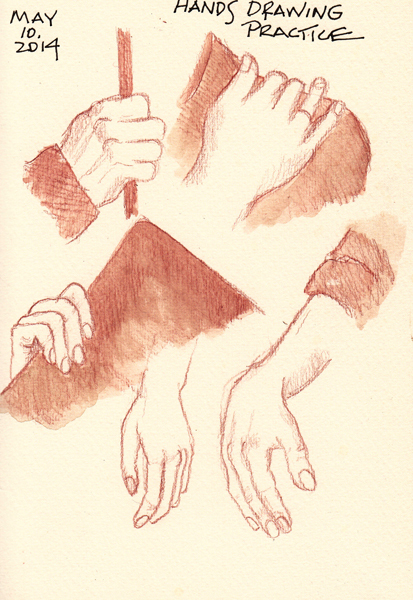 Here are 3 pages - one drawn from a Carpeaux sketchbook drawing, and the other two from magazine drawings. I'm slowly working my way through Veronica Lawlor's book One Watercolor A Day - taking weeks instead of days to do the exercises. I am a self-taught watercolor painter and thought these exercises might be fun - quicker, looser, and more wet-in-wet. This was the very first toy I bought - when my daughter was pregnant with our first grandchild. 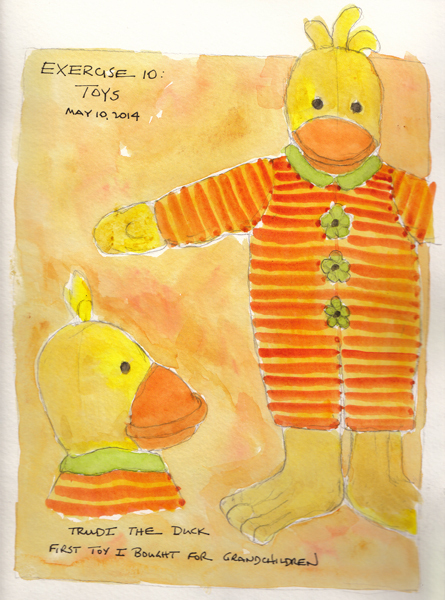 Trudi the duck still lives among the toys at Grandma's house. The flowers were painted from photos I took. The top one is from above, looking down into a dense flower garden. I used pencil to mark off the area of the flowers, then painted them. The background was added wet-in-wet. The second is a cone flower picture that I painted without using a preliminary drawing. When it was dry I added a few pencil marks for definition. 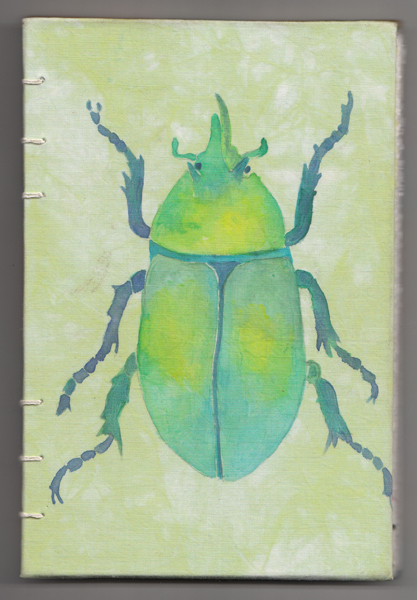 I started making my own watercolor sketchbooks when I couldn't find commercial sketchbooks that I liked. First I taught myself how to recycle old orphan books ($1-2), and then learned how to make case-bound books with black commercial book cloth. 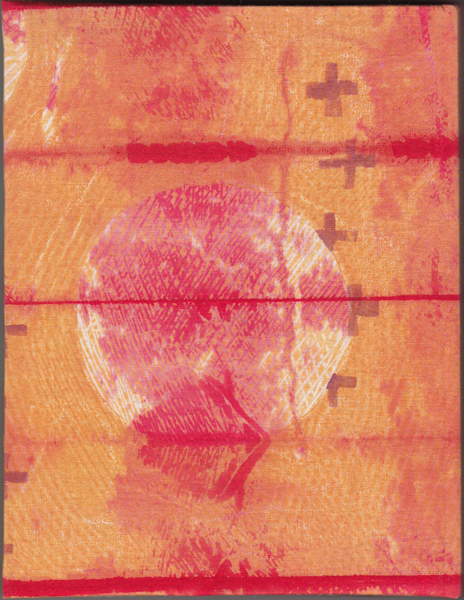 But soon I developed a way to make my own bookcloth, fusing dyed fabrics to mulberry paper. It gives me enormous pleasure to use these 48 page sketchbooks that are made with Fabriano Artistica 140 lb soft press watercolor paper. I just took a picture of this group of sketchbooks - all now full of watercolor paintings and/or graphite drawings. 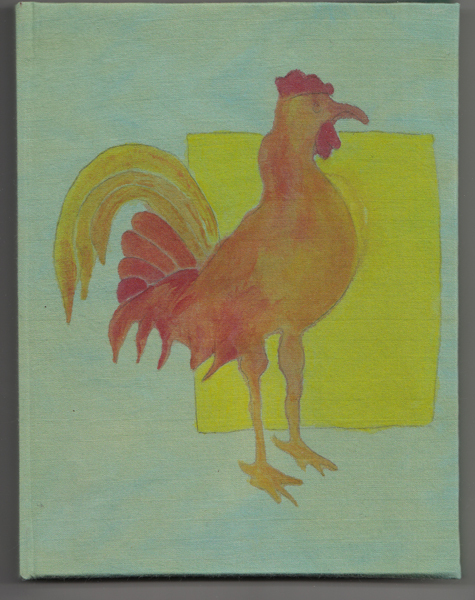 Last week I made two New Watercolor Sketchbooks: The first book cover was made by overdying a monoprint. And this one was made using Tsukineko inks mixed with aloe vera gel as a thickener. I transferred a drawing to dyed fabric and painted it using small paintbrushes. I learned this technique from Judy Coates Perez and made a Coptic stitched watercolor sketchbook using the image I painted in her Quilt Festival workshop. 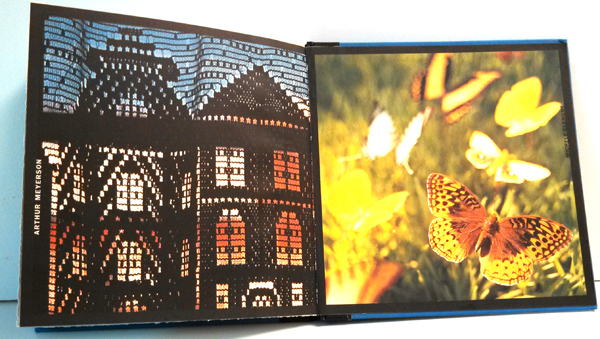 Book made from bug painting I did on cloth at Quilt Festival Workshop. Recycling Books: I also still recycle books to use as travel sketchbooks and summer beach sketchbooks. I just finished recycling a square book that I bought for $2 at the Strand Book Store in New York City and will use it on vacations this summer. 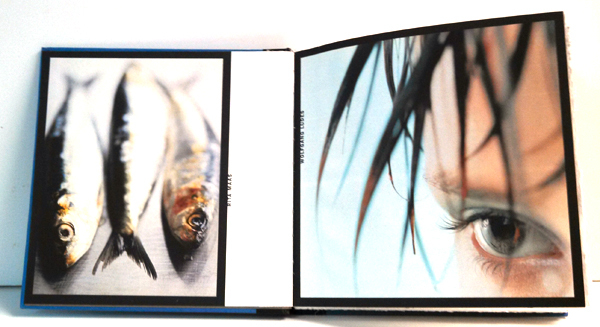 It was a book of photographs entitled Seeing:Details. 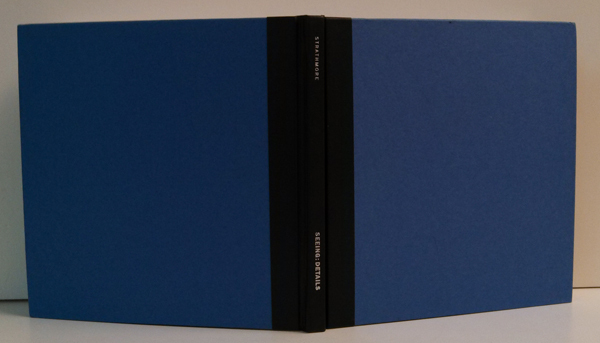 I was able to use two of the folios as endpapers in my new book. 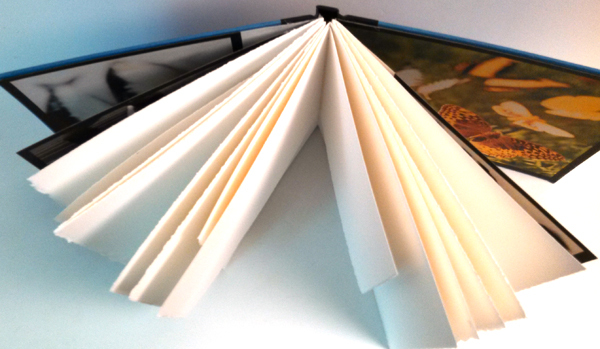 I tore my folios from 2 pieces of Fabriano Artistico soft press 140 lb paper (grain short) and some of the folios are folded asymmetrically and others are shorter - making the pages an interesting mixture and minimizing waste. In 2012 I recycled a book called Italian Dreams before we went to Venice. I made a multipart tutorial as I was making the sketchbook and here is the link to those blog posts if you would like to make one. 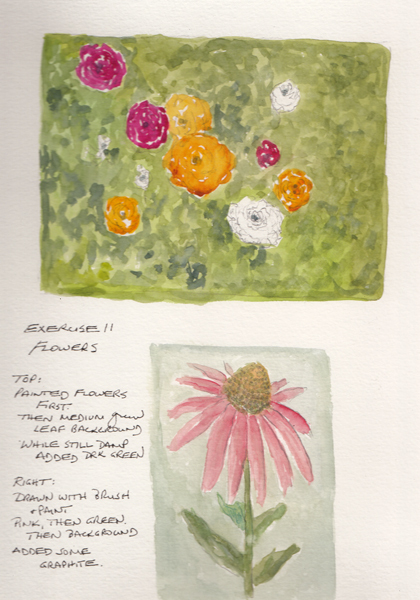 I'm interested in learning how many readers would like to continue to see blog entries or more tutorials about making watercolor sketchbooks - please leave a comment. I would be happy to share what I've learned. 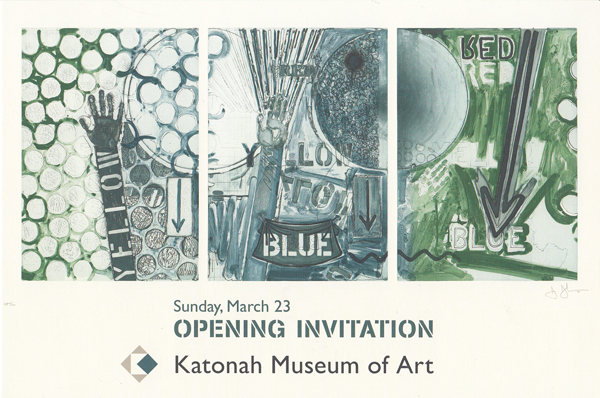 Last week we took a Road Trip to the Katonah Museum of Art in Westchester to see their current exhibit of Jasper Johns prints. 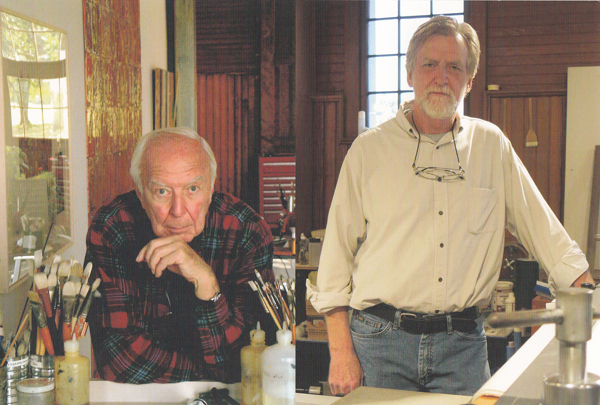 For much of his career, Johns worked exclusively with a Master Printmaker named John Lund and even moved John and his family into the gatehouse near his studio in Connecticut. 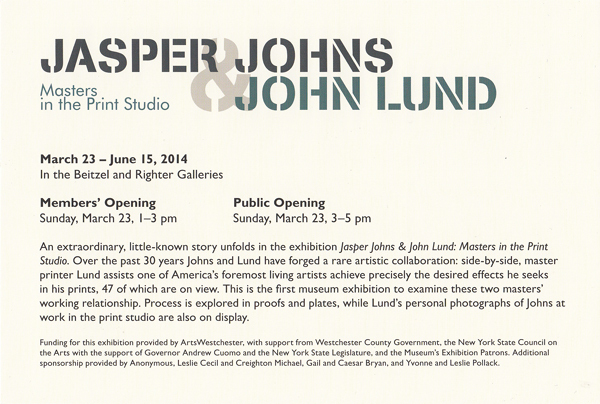 Here is the museum brochure for the exhibit with photos of both Johns and Lund. One series of prints featured in the first gallery was "Seasons" - one that is my personal favorite. 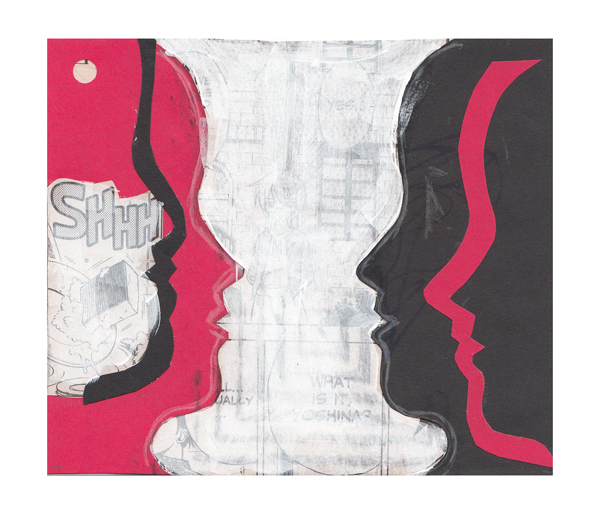 Johns typically starts with a painting, then makes prints, and then reuses and manipulates those plates with John Lund to make different iterations. When we arrived a docent was discussing the 4 prints and we were able to sit, listen, and sketch. Johns reused many symbols in his work and while I listened, I sketched many of them in my sketchbook. The big shadow is Johns, which was outlined for him by a fellow artist. The smaller one is the shadow of a 3 year old child. 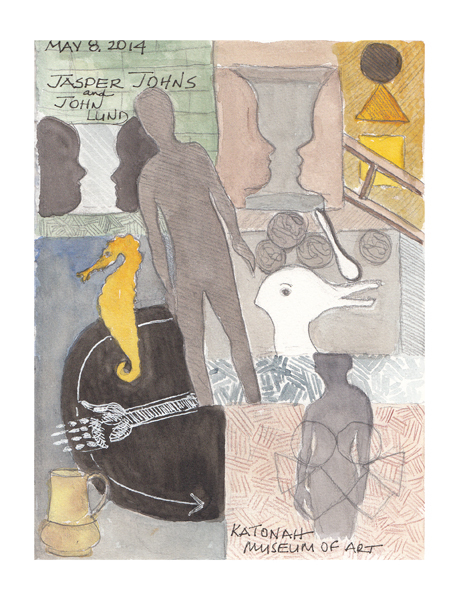 Johns loved the Rubin Vase (which is either a vase or two faces) and the duck/rabbit image and used them frequently in his work. The docent said that this was actually the time that Jasper Johns began to put a little bit of himself in his work and almost everything in these 4 prints is a special symbol for him. 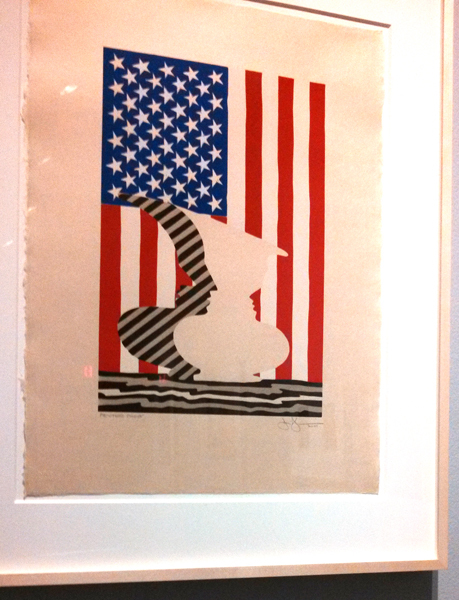 After we toured the exhibit, we spent a few minutes in the small educational center and I made my own Rubin Vase, inspired by this Rubin Vase - American Flag print. Interestingly, we were told that while we were there Jasper Johns made a short unannounced visit to the museum and none of us recognized him. Johns Flag.Rubin Vase: Can you see the 3 faces when you allow your eyes to switch from the vases? My Rubin Vase: A small collage using materials that they have in the Center for programs with children. The Metropolitan Museum of Art Costume Institute Gala occurs in May each year, the evening before a big Fashion Exhibit opens to the Members and then the Public. Two years ago the Alexander McQueen exhibit was the 8th most visited overall exhibit in Met history. 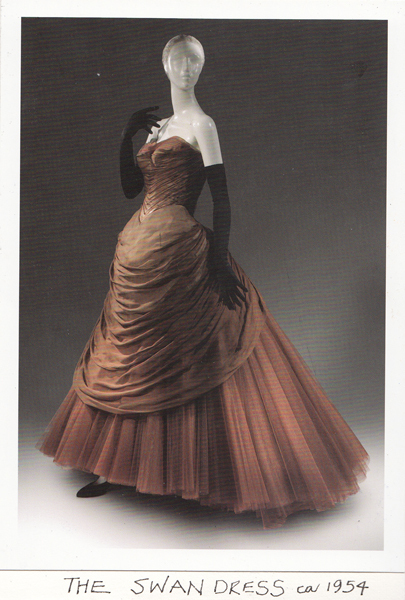 The 2014 Gala was held on Monday night for the opening of "Charles James - Beyond Fashion." He was a great Anglo-American couturier who died in 1978. He was born in Britain but spent his entire career in America and his innovations were extraordinary. The Met website has photos and videos. My daughter and I went to the member previews on Wednesday - and loved seeing the clothes and especially the 15 Ball Gowns that were distributed throughout one huge gallery - and could be seen from all sides. Here is my favorite - called the Swan Gown. The color depth for the tulle skirt was achieved by using shades of brown, and a layer each of purple and yellow. I spent Tuesday mixing complementary colors to make brown-taupe dyes in my silk painting with dyes class, but never considered how mixing the colors in sheer layers could achieve such depth of color. Charles James' other clothes (approximately 50 garments) were displayed in the new Anna Wintour Costume Institute on the ground level. 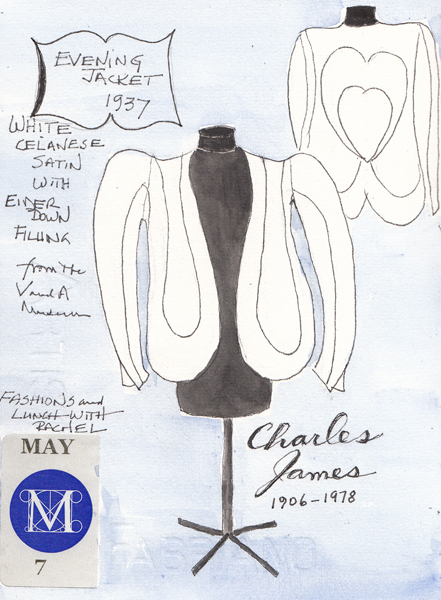 I decided to quickly sketch one of his innovations - a white Satin Evening Coat filled with eiderdown to compete with Schiaparelli's popular mink evening jackets. Each of the lines in my drawing were seams and each section of the jacket was stuffed separately with down. I finally bought myself a really warm short black down coat this winter and never was happier - or warmer! Thank you Charles James. I also read that he introduced strapless gowns and wrap dresses. If anyone would like to see how the guests in the gala were dressed, here are two links.